I was 11 years old and doing my 7th standard when my father Dr NDJ suddenly decided to move to Nagercoil. At that time I thought it was a good move since I would not have to travel by bus everyday from Neyyoor to Nagercoil and back. I still think so because it enabled my father and mother to build Jeyasekharan Hospital & nursing home, an institute of repute, serving the people of Kanyakumari and the adjoining districts. Relocating without prior planning was not easy and it was only with the help of my mother’s sisters and brother, that food ,shelter , clothing and a place for my father to work were provided. Appa started his first outpatient clinic in a two bedroom house on Henry Road opposite to Scott Christian High School. This was begun with passion ,dreams , professional expertise and nothing else. His old patients began flocking in and suddenly there was a need for a bigger place and my Mama and Chithi’s houses were made available. Thus began the Jeyasekharan Hospital and Nursing Home for inpatient care. The then medical practitioners of Nagercoil namely Dr.Reguvaran, Dr.Jeyaharan, Dr.Josaiah & Dr.Ramamoorthy warmly welcomed Dr.NDJ to Nagercoil and helped him with medicines, equipments and even a car. The comradeship among the doctors was exceptional. There were many other non-doctor friends who also helped in the starting of the new Jeyasekharan Hospital building on K.P.Road and we acknowledge their contribution with gratitude. Appa had a very qualified individual as his first assistant. A postgraduate with a MSc Zoology who had worked as a lecturer earlier. She held a honorary post of both an assistant and nurse. Her job description included house keeping, public relations, construction supervising, purchase, staff welfare, human resource, facility management, nurse, punching bag, mother and wife. She was none other than my mother Mrs Rani Jeyasekharan. The role played by her as co-founder was intangible but phenomenal. At the time when patients were coming in and the work was hectic there was a need for more professional staff. The first help came from Br. Sunder Raj and his wife Sr. Anselina. They were a newly married couple and had to stay in the side room of a house which had many patients and they dedicated their life for the growth of the hospital. Sr. Roselet joined a little later. These three and Mrs.Rani Jeyasekharan were the four pillars of Jeyasekharan Hospital. Many patients wanted to see them and were happy to be treated even if NDJ was not around. Words cannot describe the commitment and compassion shown by them. The institution grew slowly and its software in the form of dedicated staff also grew. So many names come to mind and since it is not possible to include all of them I express my gratitude to each one of them on behalf of the Jeyasekharan family. From the start of this hospital Dr.NDJ maintained patient records so much so that surgical notes from the 1960’s are available in the hospital. He had the vision to have specialists and gave them independence to work. When he was at his peak as a surgeon he decided to stop operating making way for Sabu and myself. 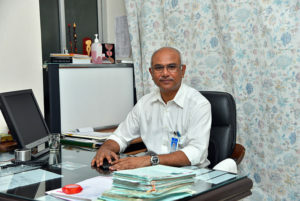 Appa was always interested in teaching and he used to teach the nurses and other staff inspite of his busy work schedule. We are very happy that new courses are available in this institution now for doctors, nurses and other paramedicals. Many doctors have passed out with DNB degrees in General Surgery and Anaesthesia and are doing well in life. We are extremely happy and proud of this achievement. Thanks to the hard work and dedication of the staff, the hospital has grown and today it is a multispeciality institution doing almost all the work done in tertiary care private and corporate hospitals. Our mother Mrs. Rani Jeyasekharan is still the nucleus around whom we all circulate. She is indeed a great blessing and we the children along with our children and grand children enjoy the affection and love at Nimmathi Nilayam – the family house. We are grateful to her for the love, support & guidance and promise that we will strive to fulfill her and our late father Dr.NDJ’s dreams and desires. His favourite quote “What higher aim can man attain, than conquest over Human pain”, continues to inspire us to give compassionate care. On the Golden jubilee anniversary of this institution I thank God, our loyal staff, patients well wishers and family for their good wishes, love and support. I wish the institution continues to grow from strength to strength.